Netflix launches a new VR service | What Hi-Fi? The app allows you to watch television in a virtual reality living room, although some users have complained of their phones overheating. 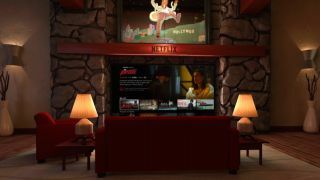 If you have an Android-powered VR platform, such as the Samsung Gear VR or Google's Daydream service, then Netflix's most recent app, Netflix VR, offers you a new way to binge-watch the next must-see TV series. Rather than putting you in the middle of your favourite show, the app allows you to watch Netflix on a virtual television in a virtual living room. The VR hook is that you can look around the room that the television is in, complete with Netflix Original Series themed posters. If your own living room could do with a tidy, or you don't like the people you're watching with, maybe this will appeal to you. Unfortunately, Netflix VR doesn't have the same functionality as other virtual reality applications. Unlike YouTube's VR experience, the screen can't be moved or made larger, so you can't use it while lying down in bed. Some users have also complained of their smartphones overheating, although one suggested having a "small fan" on while using the app. It's not quite the totally immersive viewing experience we'd expect from VR, but hopefully it's a step in the right direction.